Hello! Today's post for Lawn Fawn Inspiration week uses the new Bokeh builder set Let's Bokeh. I made a semi one layer card for today's post. One layer is very unusual for me but this set is pretty fun to layer inks with. For this card I used Lawn Fawn inks and layered the circles. I love how the inks blend together to look like bubbles. I used Celery Stick, Wild Rose, Mermaid and Sunflower. The sentiment is created by cutting glitter deco paper with the scripty cheers die and then adding the stamped portion below in black ink. Check out the Lawn Fawn Blog for more Let's Bokeh projects! Love this! The Lawn Fawn inks looks fabulous! This stamps set is sooo versatile, love it! 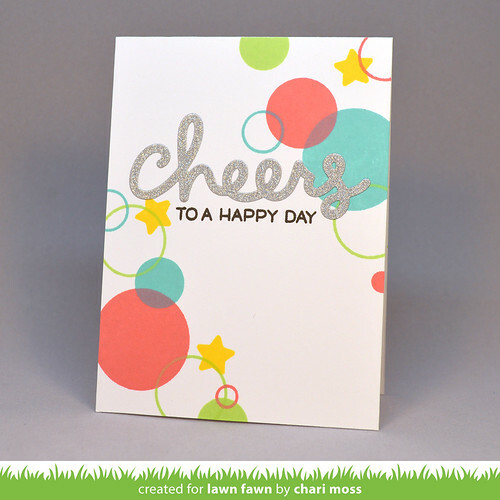 Your card is terrific and I love the Cheers sentiment! Loving this Bokeh set and the paper & inks are beautiful. This is such a super card. I love the simplicity of it but its still fun and cheerful. TFS, Chari!